Sports Marketing 4 Edition KEY BENEFIT: Sports Marketing takes a strategic business perspective, keeping pace with the ever-changing environment of the sports world. Organized around a framework of the strategic marketing process that can be applied to the sports industry, it provides an appreciation for the growing popularity of women's sports and the globalization of sport. KEY TOPICS: This edition concentrates on the rising costs, escalating salaries, the price of new stadiums and arenas, and sports ethics versus the incredible appetite of consumers for sports. 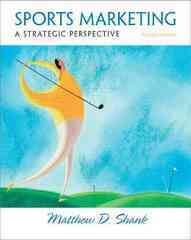 Extensive treatment is given to understanding consumers as spectators and participants; in addition to planning the sports marketing mix (product, price, promotion, and place), it examines the execution and evaluation of the planning process. MARKET: An excellent source of information for directors of sports marketing, directors of sports promotion, athletic directors, directors of community/public relations, directors of ticket sales, directors of sponsorship sales, sports marketing coordinators, sports promotion coordinators, and recreation/borough sports directors.